In many areas of restorative dentistry, metal-free materials offer an alternative to metal-based restorations while ensuring high levels of biocompatibility and esthetics. Rapidly evolving CAD/CAM technology has significantly expanded the range of materials available, providing access to materials classes and their combinations not previously available within conventional manufacturing, such as zirconia ceramics and hybrid ceramics. In addition, digital methods offer previously unavailable options in diagnostics, greater planning reliability, better material quality through standardization of the manufacturing process, and reproducibility - significant benefits that can be used to advantage, especially in oral implantology. 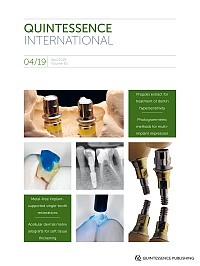 Even though technological progress in the field of metal-free materials has given rise to considerable improvements in their mechanical properties over the decades, their clinical long-term success is still very much dependent on an appropriate indication and proper material selection, on the knowledge and skills of the dental practitioner and dental technician, and on an adequate occlusion concept. The high rate of innovation - both with regard to the materials themselves and to CAD/CAM technology - therefore requires an adequate level of prior knowledge to sensibly and successfully implement the wide range of possibilities. It is becoming more and more puzzling for users to find their way around the many different new techniques and materials. This review article provides an up-to-date overview of the possibilities and limitations of metal-free implant-supported single-tooth restorations. This second part discusses hybrid abutment crowns and materials selection. Resultant treatment concepts are presented and evaluated based on clinical examples. Objective: Endodontic treatment generally results in a wide range of postoperative pain intensity. The aim of this study was to investigate the effect of preoperative acupuncture on postoperative pain in molar teeth with symptomatic apical periodontitis. Method and Materials: Thirty patients having symptomatic apical periodontitis with a preoperative and percussion pain of visual analog scale (VAS) more than 60 were included in this study. The patients were randomly distributed into two groups; G1, real acupuncture; and G2, placebo (mock acupuncture). After 15 minutes of application, root canal treatment was performed. A logistic regression analysis was used to determine the variable(s) (group, age, gender, tooth number, preoperative pain, preoperative percussion pain, and radiographic status) that controls the postoperative pain significantly. Chi-square, Mann Whitney U, and independent t tests were performed to analyze the data, and the level of significance was set at .05 (P = .05). Results: A regression analysis demonstrated that the group variable had the most significant effect on postoperative pain at day 1 (P = .003). Results showed that acupuncture reduced the preoperative and percussion pain levels significantly more than placebo group at all day intervals (P < .05). For postoperative pain at the 7-day follow-up, the pain ranged from "mild" to "no pain" in G1, compared with "moderate" to "minimal" in G2. Only one patient required postoperative analgesics in the acupuncture group compared to eight patients for placebo. Conclusions: Preoperative acupuncture can be beneficial in reducing postoperative pain in teeth with symptomatic apical periodontitis. Objectives: The present preference clinical trial compared the long-term outcome of acellular dermal matrix allograft (ADMA) versus autogenous connective tissue graft (CTG) in the treatment of gingival recessions. Method and materials: Thirty-nine consecutive patients with 233 Miller Class I and II recessions were treated by one operator (MS) with coronally advanced flaps and in addition either ADMA or CTG harvested from their palate. Clinical parameters were measured by an independent and masked assessor at baseline, 6 months, and 5 years. Results: Thirty-two patients could be recruited for long-term examination (seven dropouts). At 6 months and 5 years, all clinical parameters showed significant improvements in both groups with slightly better but statistically not significant clinical results for CTGs. At 5 years, the CTG group revealed an additional gain of keratinized mucosa width (t6m-0: CTG 1.88 mm, ADMA 1.04 mm, P = .081; and t5y-0: CTG 3.98 mm, ADMA 3.06 mm, P = .01) compared to 6 months, whereas the mean for ADMAs remained stable (intergroup comparison statistically significant, P = .010). In all other parameters in both groups, slight but not statistically significant relapses were detected. Only one minor postoperative complication at one ADMA-treated site occurred. Conclusions: Regarding the long-term results, ADMA could be an alternative treatment option to thicken soft tissue and to cover multiple gingival recessions. If the gain of keratinized mucosa width is considered as a main goal, CTG may have a slight advantage over ADMA. Conventional implant impression techniques may introduce distortions in the framework that can lead to a lack of accuracy of the prostheses. Misfit between the restoration and the implants facilitates the occurrence of biomechanical failures and prostheses complications due to inadequate stress dissipation. Digital impressions present an alternative to eliminate procedural distortions by improving the fit between the restoration and the implants. Among the different types of digital impressions, photogrammetry has emerged as an alternative for multiple implant impressions. This case report describes photogrammetric technique for a full-arch rehabilitation in All-on-four of a 68-year-old patient with a fixed implant-supported restoration on the mandible. Photogrammetric technique has demonstrated to be a successful digital alternative to conventional multiple-implant impression. Esthetics and function remained stable over a follow-up period of 1 year. No biomechanical or biologic complications were observed. According to the classic concepts of prosthodontics the treatment of a patient presenting severely worn and dischromic dentition would involve a complex and demolitive treatment including periodontal surgery, endodontic therapy, posts and cores, and crowns; nowadays these problems can be solved with noninvasive procedures that allow preservation of dental and periodontal tissues. This article describes the interdisciplinary team approach (orthodontist, dental technician, prosthodontist) for the treatment of a patient showing attrition of the mandibular incisors in a deep bite relationship, contraction of the posterior sextants of both arches, diastemas in the anterior region of the maxilla, and highly dischromic teeth. The gingival tissue levels and the tooth malposition were corrected by orthodontic therapy, the abraded and the healthy dischromic teeth were restored with 20 additional veneers (the molars were the only teeth not involved in the restorative phase); tooth structure, tooth vitality, and bone level were maintained. No provisional restorations were delivered and no anesthesia was necessary either for tooth preparation or final impression. A protocol is shown to treat in a conservative and comfortable manner the structural and esthetic problems in a patient presenting highly dischromic teeth, worn mandibular incisors, and diastemas on the maxillary sextant. Preorthodontic socket preservation after tooth extraction is intended to enhance favorable dentoalveolar ridge morphology and architecture, and facilitate orthodontic tooth movement (OTM) and extraction space closure. This 13-year-old skeletal Class II case presents a unique opportunity to evaluate and compare the OTM extraction space closure by means of a split-mouth analysis in a single patient. The comprehensive orthodontic-periodontal treatment included nonsimultaneous extraction of the bilateral periodontally compromised mandibular first molars and the eruption of bilateral impacted mandibular canines. While the right post-extraction space underwent a natural healing process, the left one was grafted using 4BONE BCH (hydroxyapatite β-tricalcium phosphate [HA-β-TCP], HA 60%, and β-TCP 40%). The 3-year multidisciplinary treatment approach resulted in Class I relationships on the right side and Class II on the left side, improved facial appearance, and dento-skeletal jaw relationships. However, a 3-mm residual alveolar space remained unclosed on the grafted left-site, along with an unerupted left third molar. This split-mouth comparative analysis of the orthodontic space closure demonstrated a significant clinical difference in the outcome. Preorthodontic placement of HA-β-TCP grafting material on the left segment, proved to be an obstacle for OTM extraction space closure, hindering the establishment of good occlusion. Treatment of a maxillary second premolar with an associated cystic lesion through conventional endodontic therapy combined with decompression and cyst enucleation is reported. Although cystic lesions frequently heal simply with endodontic therapy, refractory large lesions after nonsurgical endodontic treatment may require additional diagnosis and treatment. In this case, conventional root canal treatment resulted in incomplete healing and required further surgery. Following cyst enucleation with biopsy of the lesion and apical surgery on the tooth, the cause of the refractory lesion was found to be associated with foreign latex material in the periapical tissue, which was speculated to have originated from exposure to a dental glove. At the 1-year follow-up visit, the lesion exhibited continued resolution. Objective: Dentin hypersensitivity (DH) is a common problem with multifactorial etiology. It is characterized by a short, sharp pain due to exposed dentin usually at the cervical margin. This randomized clinical trial aimed to evaluate the efficacy of two desensitizing agents for reduction of dentin hypersensitivity (DH) following periodontal surgeries. Method and materials: This study evaluated 96 patients who had one or two teeth with DH (120 teeth). The teeth were randomly allocated into four groups for treatment with 10% ethanolic extract of propolis (group 1), 30% ethanolic extract of propolis (group 2), Single Bond Universal dentin bonding agent (group 3), and distilled water as placebo (group 4). The degree of DH was determined according to the patients' response to tactile and air blast stimuli using a visual analog scale (VAS). The level of pain was also recorded before treatment and at 1, 7, 14, 21, 60 and 90 days after the treatment. Results: All interventions (groups 1 to 3) were significantly effective in decreasing DH, and 10% and 30% ethanolic extracts of propolis were equally effective. The dentin bonding agent was completely effective at all time points. All three interventions (groups 1 to 3) effectively decreased DH at 60 and 90 days. Conclusions: This clinical trial showed all interventions were more effective than the placebo in decreasing DH. The tested propolis extracts were equally effective irrespective of their concentration. Application of Single Bond Universal had a fast relieving effect on DH. Propolis extracts and dentin bonding agent were equally effective in relieving DH in the long term. Clinical relevance: DH following periodontal surgery causes patient discomfort and hinders everyday activities. Propolis is a natural desensitizing agent with antimicrobial and anti-inflammatory properties, healing effects, and cariostatic activity. It also stimulates reparative dentin formation. Flavonoids and cinnamic acid derivatives are the main biologically active components in the composition of propolis. According to the results of this study, application of propolis is recommended for patients with mild or moderate pain. Dentin bonding agent could be a better choice when immediate effect is needed. This short report describes a clinical case in which an implant-supported crown was made using an extracted natural tooth as the outer shell. The same tooth had been previously relined for immediate loading without occlusal contacts. Using digital software, a composite resin mesostructure was fabricated in order to place the crown in the correct occlusal position, and the natural crown was ground using a computer-controlled milling machine to perfectly fit on the mesostructure.